NEW - Available For Shipping NOW ! This clear panel clipboard offers a slot on the back of the board that allows paper to be inserted, protected and viewed from both sides. Choice of clip styles: Plastic (SC square shown or RC rectangle clip), Metal, Wire, Clip with Clock, Clip with Calculator or Light. Place your company's flier or pamphlet in between two clear plastic panes and see from both sides. Holds up to 3 sheets. Prices include 1 color/1 location imprint on clip only. Screen Charge: $45 per color/location. Additional color/position run charges are listed below. Board imprint NOT available on this item. Pricing on form below is for image show. Orders for wire clip, metal clip, clock clip, calculator clip and light clip will follow the price grid below but must be placed by phone. Please call 800-884-8095 to place your order. 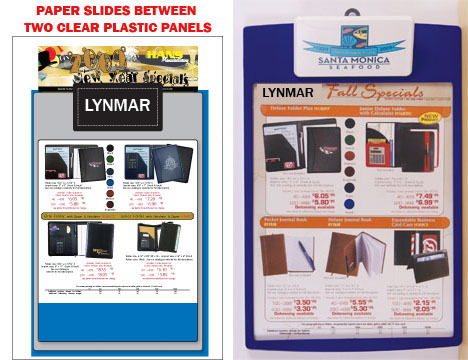 Minimim imprinted order is 25 clipboards with a $50.00 less than minimum fee. Minimum blank goods (no imprint) is 10 pieces. No less than minimum fee. We reserve the right to make changes to our prices at any time.